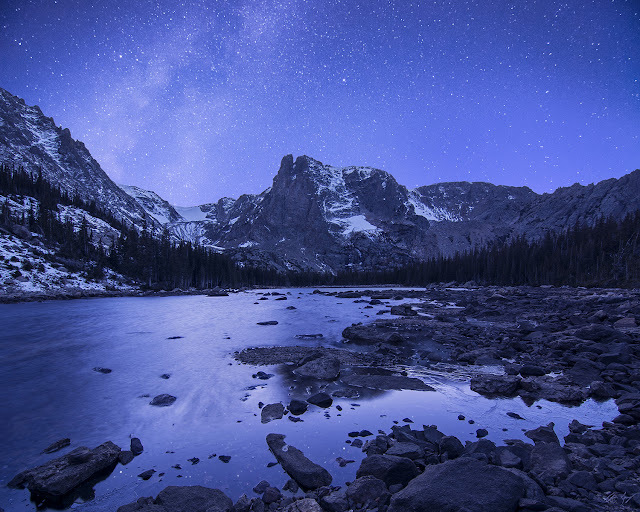 This nighttime image is taken at Two Rivers Lake in Rocky Mountain National Park, Colorado. The lake is a bit off the beaten path making it a little less visited than other popular lakes in the Park. The photograph was taken around 8:30 PM in early November. The prominent peak in the center of the photograph is Notchtop Mountain, a 12,000 ft. peak that sits on the Continental Divide. Photographs that look like this are composites of two images due to the extreme contrast of light between the sky and the ground. One exposure is taken of the peak and foreground while the other is taken of the starry sky. Then, the two are combined in post processing. your site onn my iphone during lunch break. I really like the info you present here and can't wait to take a look when I get home. I'm amazed at how quick your blog loaded onn my phone .. I'm not even using WIFI, just 3G ..